Do you ever wonder “Should I be promoting my business with paid social media?” but you’re not sure how to go about it? Then this list is for you. At Vet Inflow, we create and manage a variety of campaigns for clients with diverse objectives and budgets, and we know there is a campaign out there that perfectly fits your needs. 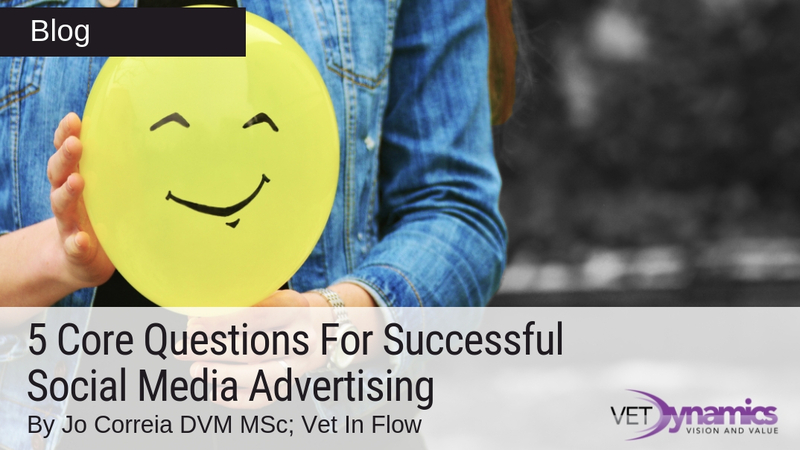 Jo Correia, DVM MSc and Veterinary Communication Manager at Vet Inflow, helps you ask the right questions to put you on the track to success. This sounds like a profoundly existential question, but knowing what your business is about and how you want your clients to see you is the guiding line for everything that follows. Who you are will determine what platform best fits your needs, what type of ads you should be creating and who your core audience is. These and other critical details will make or break your campaign. A practical example: A state of the art referral practice might want to be seen as highly professional and always at the forefront of innovation. Facebook and LinkedIn are likely to be platforms where they might want to focus their attention on, they’ll want to create ads that reflect their unique services, and they’ll need to choose the best way to serve it to an audience that wants to see it. In contrast, a local practice that is deeply involved with their community will be on Facebook, Instagram and Twitter to promote their open days and pet shows, proudly showing their clients all the terrific work they do, day in and day out. How do I work with my chosen platform? How does it put my content in front of my audience? How does it measure how well I’m doing? In what ways can I achieve my goals? How can I customise ads to cater to my needs? In our experience, the best way to promote a veterinary practice is through Facebook and Instagram as they both have a substantial user base, a wealth of ways to serve content, are mostly business-to-consumer oriented, and Facebook is still top of the line when it comes to pinpointing your audience. One thing is for sure; social media platforms are always changing. Don’t forget to keep up with updates and news, what works today might no longer work tomorrow. Do you feel like it’s not working out anymore? Move on to greener pastures! Your choice of budget, type of ad and audience all depend on this seemingly simple question. There are many ways to advertise on social media. To choose which one is best for youyou’ll need to know what you’re planning on achieving. Explore your options – do you want people to see your content on the platform? Do you want them to engage with you and boost your brand awareness? Do you want them to buy more of your products? Do you want to direct people to your website or blog? Concise marketing objectives help you keep focused on what matters and to avoid creating ads that are not appropriate for your goals. As I’ve mentioned in question 2, Facebook is top of the line when it comes to audience optimisation. The surgical precision it can serve your campaigns to potentially interested people is fantastic, but that means you need to know who you want to talk to and how to talk to them. This demonstrates the power of audience optimisation, and to a greater or lesser extent, any social media platform will let you select what audience you wish to interact with. Use this to your advantage and don’t just let it decide for you. Look at your page’s insights to see who is usually on your page and try to reach a smaller, more focused audience rather than expanding your reach to include a large number of indifferent people. The most significant advantage of advertising on social media is how low cost but highly effective it can be. Compared to any other sort of advertising, it can reach a massive number of people at a fraction of the cost. As a rough estimate, £10 or £20 once in a while will go a long way on your social media presence! Search around for what might be a reasonable starting budget for the type of ad that you have, test it and readjust when necessary. Some types of ads are more expensive than others. If your budget isn’t high enough for that kind of advertisement (for instance, directing people to your website), consider changing it to something where the amount of money you’re willing to spend will be more efficient (for example, a post directed at increasing interactions and brand awareness). Ultimately, the most important thing to remember is to try and continuously optimise your ads in any way you can. If it’s true that a budget might be too small for you to reach your objectives, it’s also true that throwing a massive budget in the wrong direction will not solve your problems either. Analyse your metrics, pay attention to trends, be on the lookout for opportunities and don’t stop optimising so you know you are getting the most out your social media investments!